﻿ 1 John 4:1 Beloved, believe not every spirit, but try the spirits whether they are of God: because many false prophets are gone out into the world. Dear friends, do not believe every spirit, but test the spirits to determine if they are from God, because many false prophets have gone out into the world. Dear friends, stop believing every spirit. 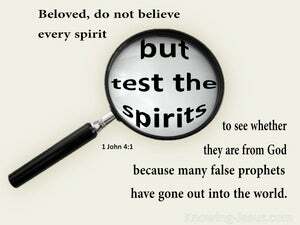 Instead, test the spirits to see whether they are from God, because many false prophets have gone out into the world. Beloved, do not believe every spirit, but examine the spirits, whether they are of God, because many FALSE prophets have gone out into the world. Beloved, believe not every spirit, but prove the spirits, whether they are of God; because many false prophets are gone out into the world. 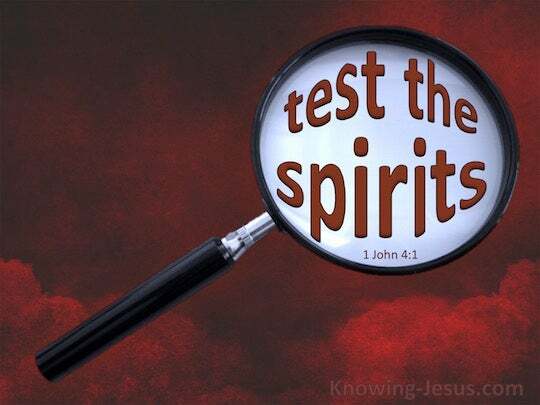 Beloved, do not put faith in every spirit, but prove (test) the spirits to discover whether they proceed from God; for many false prophets have gone forth into the world. Loved ones, do not believe [the message of] every spirit [i.e., every person claiming to be a teacher], but test the spirits [i.e., require proof that they and their message are genuine] to see whether they represent God [or not], because many false prophets have begun circulating throughout the world. Beloved, believe not every spirit; but prove the spirits, whether they are from God: for many false prophets have gone out into the world. My loved ones, do not put your faith in every spirit, but put them to the test, to see if they are from God: because a great number of false prophets have gone out into the world. Beloved, do not believe every spirit, but test the spirits to see whether they are of God; because many false prophets have gone out into the world. Beloved, believe not every spirit, but prove the spirits, if they are of God; because many false prophets are gone out into the world. Beloved, do not believe every spirit, but try the spirits, whether they be from God; because many false prophets are gone forth into the world. Beloved, believe not every spirit, but prove the spirits if they are of God: because many false prophets have gone out into the world. Dear friends, do not believe every inspired utterance, but test the utterances to see whether they come from God, for many false prophets have come out into the world. Beloved, believe not every spirit, but try the spirits, whether they are of God, because many false prophets are gone out into the world. Beloved, do not believe every spirit, but try the spirits whether they are of God because many false prophets are gone out into the world. Dearly beloved, believe not every spirit, but try the spirits if they are of God: for many false prophets have come out into the world. Beloved, believe not every spirit, but test the spirits whether they are of God: because many false prophets are gone out into the world. Dear friends, do not believe every spirit, but test the spirits [to determine] if they are from God, because many false prophets have gone out into the world. Beloved, do not believe every spirit, but try the spirits to see if they are of God, because many false prophets have gone out into the world. 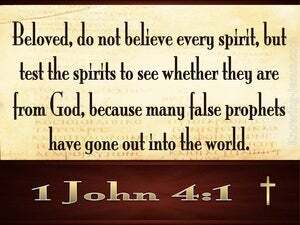 Ye beloved, believe not every spirit: but prove the spirits whether they be of God, or not: for many false prophets are gone out in to the world. 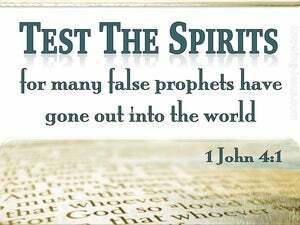 Do not believe every spirit, beloved, but test the spirits to see if they come from God; for many false prophets have emerged in the world. Do not believe every spirit, beloved, but test the spirits to see whether they are of God; for many false prophets are gone out into the world. Beloved, do not believe every spirit, but test the spirits, whether they are of God, because many false prophets have gone out into the world. Beloved, believe not every spirit, but try the spirits, whether they are of God; because many false prophets have gone forth into the world. BELOVED, believe not every spirit, but prove the spirits whether they are of God; for many false prophets have gone out into the world. Beloved! not in every spirit, believe ye, but test the spirits, whether they are, of God; because, many false prophets, have gone out into the world. BELOVED, believe not every pretender to inspiration, but bring these spirits to the trial whether they are of God; because many false prophets are gone forth into the world. Dear friends, do not trust every inspiration, but test each inspiration, to see whether it proceeds from God; because many false Prophets have gone out into the world. Beloved, believe not every spirit, but try the spirits whether they are of God: because many false prophets have gone out into the world. 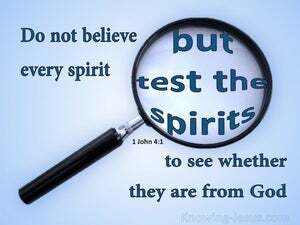 Dear friends, do not believe every spirit, but put the spirits to the test to see whether they are from God; for many false teachers have gone out into the world. Dearly beloved, stop believing every so-called spiritual utterance, but keep testing them to see whether they come from God, because many false prophets have gone out into the world. 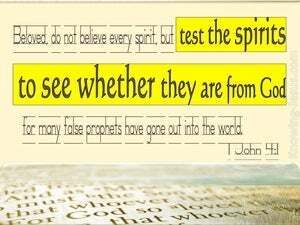 Beloved, don't believe every spirit, but test the spirits, whether they are of God, because many false prophets have gone out into the world. Beloved, believe not every Spirit, but try the spirits, whether they be of God: for many false prophets are gone out into the world. The prophets prophesy falsely, and the priests bear rule by their means; and my people love to have it so: and what will ye do in the end thereof? For thus saith the LORD of hosts, the God of Israel; Let not your prophets and your diviners, that be in the midst of you, deceive you, neither hearken to your dreams which ye cause to be dreamed. For I know this, that after my departing shall grievous wolves enter in among you, not sparing the flock. For they that are such serve not our Lord Jesus Christ, but their own belly; and by good words and fair speeches deceive the hearts of the simple.